Finely chop 250 gr of strawberries. Put in a bowl and add the water, the lemon juice, the liqueur and 2 tbspoons of sugar. Leave to infuse for half an hour. In the meantime make your mascarpone cream: separate the eggs and beat the yolks with the remaining sugar. Whisk the egg whites until stiff and stir gently in the mascarpone mixture. Strain the strawberries (keep them on one side) and put the juice in a food processor. Add the remaining 250 gr. of fresh strawberries and liquidize. 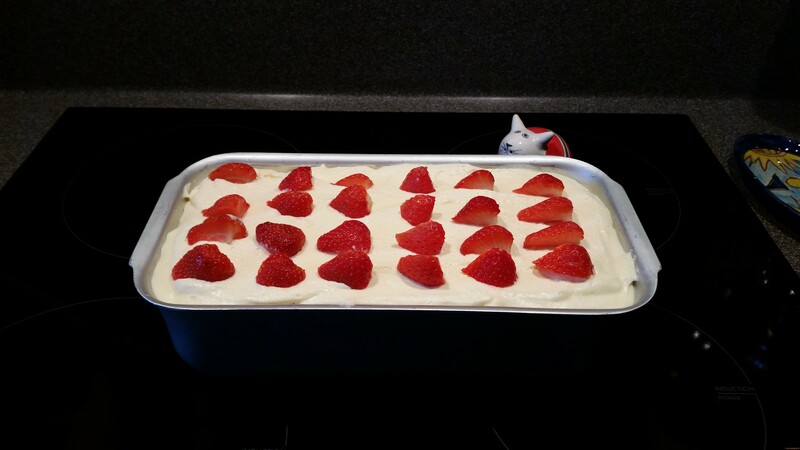 Dip the savoiardi in the strawberry mixture and put a layer at the bottom of a dish (I used a large bread loaf tin). 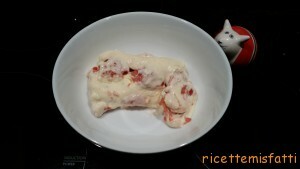 Put half of the chopped strawberries on the top and cover with mascarpone mixture. Repeat the procedure to form another layer. 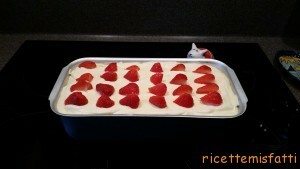 Finish with the mascarpone mixture and decorate with fresh strawberries.